Create an escape from the stresses of life right where you live. 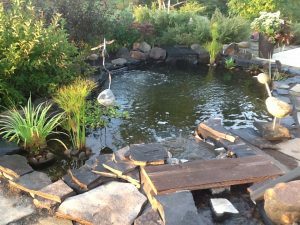 Complement your outdoor living space with a beautiful water garden or pond to help you relax and unwind. At Vanderwees Garden Gallery, we carry a large selection of water features, from fountains to ponds, and have expert staff to help you find exactly what you need. From calculating the size of pond liner, determining the type of pump you need, and deciding which water plants best suit your feature we can help you every step of the way. 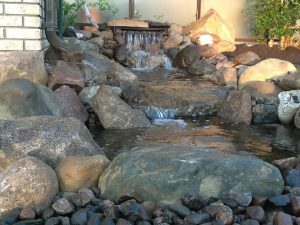 Looking to create your own custom water feature? We have all the parts for that special water project! For great tips, tricks, and how to’s visit the Laguna website. 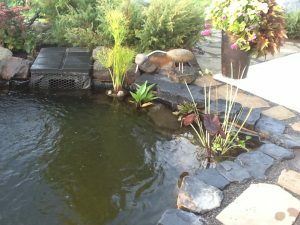 To see the large selection of water features and ponds available to us visit the Atlantic Water Gardens website. We feel lucky to work with so many great people on their water gardening projects. 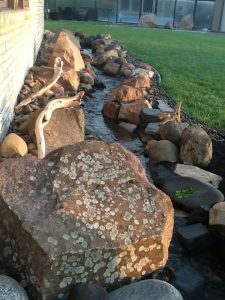 Often customers come in and talk to us about how they envision their water feature looking and we help them find the right products to get the job done, but we don’t often get to see the end results. 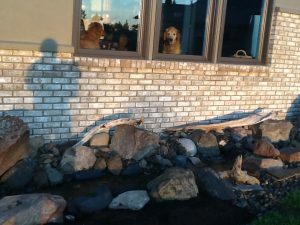 Recently a customer wrote to us about his experiences both with us, and creating his water feature and we wanted to share their experience with you! “Thanks Ken for the advice and materials to make this all happen. I have learned you can never have enough rock. The pond was dug 4.5 ft deep with squared sides into previously compacted gravel near the house. Ledges were squared in for plants and the whole thing framed in with green 2×6’s and 1/2″ green plywood. I capped the outer rim with green 2×8’s. This makes it easy later to attach rubber and lay cap rocks. The whole pond was then lined with mill felt. Landscaping fabric would also work. I then cut in the skimmer box and ran the hosing along the side of the pond under the cap board. I manually dragged the heavy pond rubber into place on a warm day, which allowed easier folding of the creases. I then connected the rubber to the skimmer box with the silicone provided. There was a natural slope to the land along the side of the house. I started by positioning my water fall form on some old brick slabs I had on compacted ground and using a level I lined things up. I then ran the 2″ hose under ground. I did not run the hose along the house because I thought the big rocks may squash it and reduce the flow. The trade off was that on the grass side the pipe was, at times, where we wanted to edge or plant. I then went to the manual to calculate the water available in the pond for the volume of flowing(transitional) water l could have in the stream. This is an easy but important calculation (since I had failed to do this on my first stream and was very disappointed when my large stream bed sucked all the water out of my pond leaving the motor high and dry. A sad day). I had calculated that I could have an average depth of 3″ and a width of 1 1/2 ft. This is really an estimate because of the pond and stream irregularities. However it gave me a starting point. I began forming the stream bed in compacted soil imaging the meandering of a real creek. I started at the waterfall and worked downward to the pond maintaining slope and building some elevation drops when feasible. The other thing I did in advance was to dig out pockets for rocks at the side of the stream bed that would accept larger rocks/boulders after the pond liner was in place. I did use bricks in a few places to square up my stream edges (green wood could also have been used). I then removed any sharp rocks and placed landscaping fabric. I did not use mill felt here because it was less flexible. I had a single piece of rubber that I used for the stream bed however multiple pieces could be used if overlapped properly. I extended the rubber out 3-4 feet on either side of the stream bed and upwards in elevation. The rubber will be cut later. I had some excess rubber strips so placed them in the stream bed as extra protection since I would be placing some larger rock inside (remembering the pockets I dug out in the early preparation stages). I had previously gathered an assortment of rock of all sizes. Fractured rock has nice fresh angular surfaces that reflects light and water nicely. Tumbled River Rock has its own character, water will stick to its surface and follow the rock contour so does not lend itself to waterfall structure. Fractured rock was used to build the abrupt changes in vertical elevation in waterfall design. I started placing my first large rocks on either side of the waterfall to define the outer parameters, I then used more fractured rock to build the face of the falls. 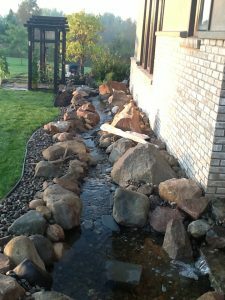 That done I placed my largest rocks randomly along the length of the stream, in the pockets and on the perimeter outer edges, followed by the next largest. Keeping in mind not to squash the rubber liner below the height of the stream, also taking care not to perforate the rubber. 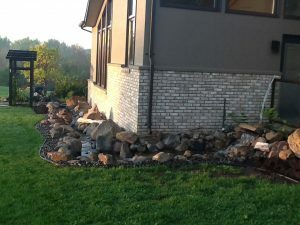 I used my tractor to sling the larger rocks into position and a two wheel dolly to move the next size (Tool town sells a suitable dolly for $99.00. A real deal, it held up well). When placing rocks I tried to maintain the random assortment of size and shape as seen in nature. The stream bed was filled with the pre-washed gravel typically used on flat commercial roofs. I then used landscaping foam to back fill the waterfall areas inserting additional rock and gravel to hide the foam. (Messy stuff, back fill deep and let it flow up to you then set the can on something because it drips a bit). This procedure forces the water in the direction you want it to go, eg. over the falls instead of seeping behind. I trimmed any extruding set foam easily with a knife the next day. I then connected my pump that sits in the skimmer, filled the pond and the water fall box and any low areas in the stream bed and was ready to try it out. All the important dignitaries were present(Karen and friends) cameras at the ready. The pump was plugged in, we all waited with heightened anticipation… nothing happened other than water trying to squeeze out of my connections near the pump. I had reversed the foot valve, dah!. Never was much of a plumber. Easy to disconnect, pipe orientation reversed, reconnected, back in business. Plugged in the pump, tadah! Here comes the water. Now is when I find out whether my rough calculations are correct. If I am wrong I will not have enough water in my pond to allow water to flow into the skimmer box. My pond water level dropped about 1 1/2 inches, it worked. More rock and plants will be placed to finalize this creation. I have yet to build the little bridge over the stream near the pond. A winter project. Our koi are happy in their new home. I had noticed over half a day my water levels dropping in the pond, went back checked all connections, they were good. Then the next reason is water escaping over the liner edge. As suspected I had squashed, not perforated, my stream liner by a heavy rock and the water was redirecting out of the stream. An easy fix move a few rocks pull up the liner to a better height, reset the rock. Problem solved. The fish will spend the winter in the pond, to big to bring indoors. I now run an aerator, fish love the current and oxygenation will help with algae. The aerator will run all winter to keep the ice open, I also have a 350watt floating heating unit that will be in place. This is our first winter with the fish in the pond, have seen them go into hibernation mode in the cold aquarium indoors, so expect they will do similar in the pond. They do not eat during this period, just float together in a corner. I run the 45 ft stream only during the day to conserve hydro. It is a real pleasure to listen to the flowing water, soothing and natural. The whole project took about 3 weeks, a bit of sweat and creativity. Total cost was about $5,000.00. I provided my own rock. It was a pleasure to work with your advice and suggested materials Ken. 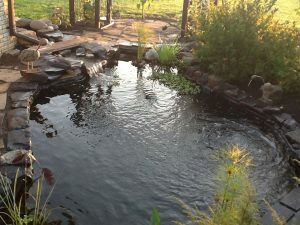 Beautiful water gardens/features can be created on any budget and can provide years of pleasure. Our gardens here at Season’s in the Country are ever changing as the years pass and provide us with a parkland setting to come home to after a day’s work. Thank you for the trees, shrubs, perennials, and building materials you have provided over the years.